Anjem Choudary signs himself "UK Head of Al-Muhajiroun," a banned British group. London, England (CNN) -- A controversial British Muslim cleric is threatening to stage a march through the town that receives the bodies of British war dead as a protest against the war in Afghanistan, drawing fury and outrage. Anjem Choudary has accused soldiers of "murderous crimes," and said the United States and United Kingdom are seeking to "establish their own military, economic, strategic and ideological interests in the region." His organization proposes to parade empty coffins through the streets of the English town of Wootton Bassett, where the bodies of British war dead are traditionally brought when they return to the country. But the threat itself prompted more than 215,000 people to join a Facebook group opposing the march as of Monday, a day after he posted a letter online justifying it. Most people in the Islamic community believe that those people who have adopted a perverted view of Islam to justify murder as terrorism are outside the traditional elements of what is a peaceful faith. "The highway for heroes & wonderful people of WB do not deserve this march to happen," the group's home page says. "This group can march anywhere it wishes in the country but have chosen WB to cause outrage & offense. Islam4UK is an extremists (sic) Islamic group & does not represent the Muslim community in this country." Choudary's open letter, "To the Families of British Soldiers who have died or who are currently in Afghanistan," appeared on the Web site of his organization, Islam4UK, on Sunday. The group had announced its intention to stage the protest earlier in a short statement on its Web site. "The procession in Wootton Basset (sic) is therefore an attempt to engage the British publics (sic) minds on the real reasons why their soldiers are returning home in body bags and the real cost of the war," Choudary wrote. "The parades, the speeches about soldiers doing their duty and the feeling of patriotism has obfuscated the reality of the conflict and the murderous crimes being committed by the occupiers and their agents. 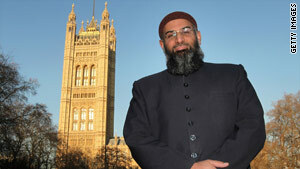 The British public is blissfully unaware of what is being done in their name," Choudary wrote. "Afghanistan is not a British Town near Wootton Basset (sic) but rather Muslim land which no one has the right to occupy, with a Muslim population who do not deserve their innocent men, women and children to be killed for political mileage and for the greedy interests of the oppressive U.S. and UK regimes," he said. Choudary signs himself "UK Head of Al-Muhajiroun," a banned British group which supports al Qaeda. Choudary spoke positively of Osama Bin Laden in the letter and in interviews with British media on Monday. British Prime Minister Gordon Brown said Sunday that there would be "no support" for the march or Choudary's "perverted view of Islam." "I think most people in the Islamic community believe that those people who have adopted a perverted view of Islam to justify murder as terrorism are outside the traditional elements of what is a peaceful faith," he said. "The vast majority of the Muslim population in this country and other countries agrees with my view on this," Brown said. Police in Wiltshire, the county where Wootton Bassett is located, said they had the authority to control the terms and conditions of the march or even to apply to ban it if Choudary took steps towards staging it. "If the march or procession is believed to be likely to result in serious disorder, disruption or damage, then the police can impose conditions upon the organizer," the police said in a statement. "In exceptional circumstances, the police may apply to the Local Authority for an order prohibiting such a march." "To date there has been no contact from Islam4UK or any other group wishing to arrange such a march in Wootton Bassett," they said.